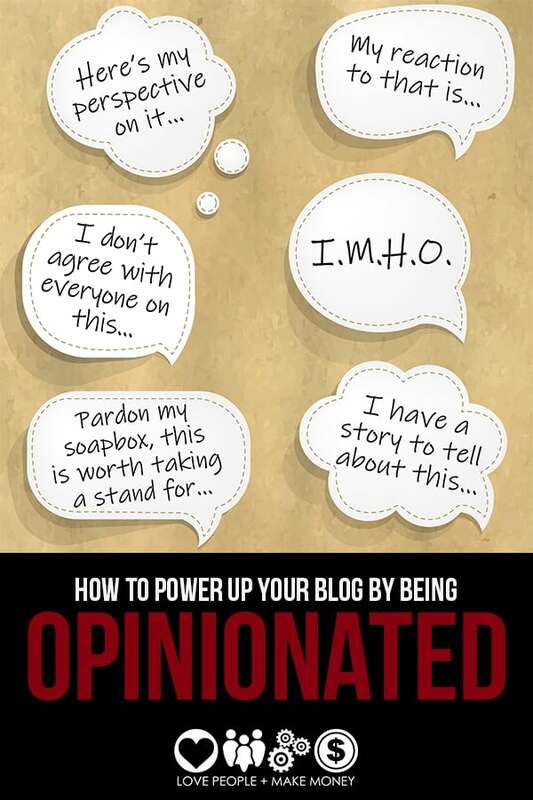 Many blogs today with high readership have one thing in common: Opinionated bloggers! It’s one thing to share news and information. It’s another thing entirely to share opinions. News–even important news–can be fairly dull when repeated across hundreds of blogs. Bold, spoken opinions about that news is engaging. It’s the difference between the six o’ clock news and a commentary program on the comedy channel. They’re both talking about the same thing but one is infinitely more interesting, inspiring reactions and opposing opinions that draw even more attention. There’s a lot of boring blogs out there on the net sharing too much news and too few opinions and I think it’s a shame. I have asked friends and clients why they hesitate to share their opinions on their blogs and the common response is that they don’t want to alienate anyone. If you feel the same way, I have some reassuring news for you. I don’t agree with many of the blogs I read on a regular basis. It’s true! I subscribe to many blogs just for the flavor factor that comes from being totally annoyed by an opposing opinion. Is it crazy that I enjoy feeling outraged once in awhile? Not at all. Tasting bitter fruit now and then reminds me of what I have worked so hard for in my community and makes me appreciate the many awesome blogs that I agree with. Being opinionated has grown my business. Back in the day when I shared my opinions about home business scams, slimy multi-level marketing programs, and various time- and money-sucking promotional programs that float around the work-at-home-mom community, I made a few enemies. More importantly though, I have gained a loyal circle of influence. Subscribers, listeners and customers appreciate that I walk a thin line and carry a big stick. We don’t all operate in environments where scammers and spammers have to be beaten back now and then, but I believe all bloggers can occasionally benefit from a well stated opinion. In fact, I’ll go so far as to say this: All else being equal, if you’re not getting the traffic you want and the income you want… you’re probably not being opinionated enough. Face it: people don’t read boring bloggers. It is going to happen. Some are going to read your opinion and be annoyed. That is OK! Some people like me will respect your right to an opinion and keep reading even though they completely disagree with you on the issue. A few people will get their noses out of joint and decide they can’t read anything from someone who thinks that way. If someone is going to discount me as a whole person based on one issue of disagreement, I’m not going to cry about it. It’s their loss. Don’t create trouble where none exists. Having a strong opinion is not about stirring up trouble. I don’t like it when people create controversy – but I love it when people address what already exists. If you’re going to step out and share an opinion on your blog, don’t be surprised when someone leaves a steamy comment. I consider my blog to be the virtual equivalent of my living room a comment the equivalent of a stimulating conversation over coffee. Agreement is not a prerequisite. So long as they haven’t been rude I’m willing to let their comments stand and if I have a constructive response, I’ll be sure to share it. There are some instances when a guest crosses the line and has to be shown the door – and the same goes for rude comments. I don’t mind employing the delete key when someone isn’t being constructive or has crossed over to being a blog bully. Don’t use your blog to settle personal scores. If you’re angry with someone, write them an email. Send them a private message. Give them a call. Don’t call them out (with or without names) on your blog. It’s tacky. Of course, if you have tried all of the above and can’t get a reply – I have seen very tactful use of ‘Open Letters’ on blogs. Use your best judgment. It is not enough to boldly declare an opinion about something. If you want to win respect and possibly a convert or two, you will want to provide the reasoning and share your experiences that stand behind your opinion. Keep your opinions on topic. Opinions are potent. Stating a strong opinion and then standing firm behind it is polarizing. It draws some people to you and pushes others away. Your business blog is an integral part of your marketing plan and you should be deliberate in your decisions – even when being opinionated. Make sure you’re attracting and pushing on the right topics. There’s no sense in aggravating people over topics that have no bearing on your business and personal values. Earn the right to express your opinions. If you’re the new kid on the block, take care with how quickly you share opinions. There’s something to be said for establishing yourself as a solid blogger before jumping into the deep end. People don’t care how much you know until they know how much you care. Don’t focus all of your opinions on the negative. You don’t have to find something that annoys you to have an opinion about. You can have an opinion about something great too. Strike a balance and avoid being pigeon holed as a complainer. If you'd like to really dig into being more opinionated with your content, congratulations! I'll invite you to jump on my What's Your Stand Banner Message Training. I've designed it to help you identify those topics you're excited to express an opinion about. Blow it up into content in different formats. Bubble & Buzz to spread it far and wide. I’m sure you may be able to add a tip or two to this list and please don’t hesitate to do so in the comment section. If you’ve been hesitant about being opinionated up to now, I hope you feel inspired to step out and share a fresh strategic opinion real soon. I have been recieving some emails about brandable content. I just don’t know where to start and I really need to make some income. I am 60 years young, computer literate but I don’t know how to move forward.